In this post we will look at stress in some special circumstances such as in compound nouns and in abbreviations. This post will go along with the podcast I posted on the right side bar. It is called Stress in Special Circumstances. Compound Nouns; always stress the first word in the compound noun. Say the following words stressing the first word, and then create sentences for each one. Abbreviations: Stress generally falls on the last letter. 2. Is the program on ABC or HBO? 3. He received his B.A and M.S from UCLA. 5. The conference was filled with RN’s and LPN’s. 6. The CEO and CFO are on the Executive Board of that organization. 8. The VIPs waited in the greenroom before their appearance on NBC. 9. Insert the CD in your PC or laptop. Numbers: When counting stress the first syllable in ‘teen’ numbers and the second number above 20. When stating numbers for time, money or amounts then you stress the last part of the teen numbers. When referring to the ‘ten’ numbers like twenty or thirty stress the first syllable, when stressing numbers other than the ‘round’ numbers stress the last part like 1:54. 1. The train going to Boston leaves at 10:22. 2. He will arrive at 2:30. 3. I scheduled your meeting for 11:15. 4. The reservations are for 7:30. 5. He lives at 25 217th street. 7. Is there fourteen or fifteen people in the group? 8. He called 15 times this morning! 9. I always shop on 5th avenue. 10. I have twenty more minutes. 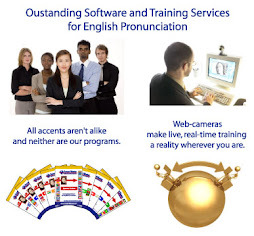 Improve your American English Pronunciation Today! What will you do today that will move you closer to speaking English like a native? Read this article? Listen to the podcast? These are great beginnings but you and I both know you need to "step it up a notch" (Try a little harder) to start pronouncing English like a native. Even if all you have is the lessons from this blog, it is a good place to start. For starters you can go back over this post and read it aloud. Reading aloud gives you more practice in verbalizing English, and takes away the burden of needing to create sentences and recall vocabulary at the same time, as you need to do in conversations. Another thing is to make a schematic. Write down or print out a paragraph, hopefully something related to what you may talk about in your regular day. Then you take a pen or a pencil and mark up the paragraph. For example circle the /r/'s, place a stress marker over the stressed syllables and underline the voiced consonants. Mark anything else that is challenging for you. Use different colored pens if it helps. Now read the paragraph aloud. This is dedicated practice and will help you as you incorporate new pronunciation skills into your speech. It is best to record yourself reading aloud if you have that capability on your computer. If you `can record I suggest that you first record yourself reading the paragraph without the marks and then again after. You will be surprised to see the marked difference in the flow and intelligibility of your speech. 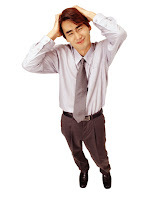 Don't stress over word stress! Word stress in English can be challenging. This is because American English incorporates words from many language backgrounds including, Indian both American Indian and from India, french, Latin, German, polish and every other language. As immigrants continue to influence our language we and they as new American create there own twist to these words, most frequently changing the stress pattern. It is also true that we don't stick to one pattern, as in French where stress nearly always falls on the final syllable. And we don't mark the stress in our writing like in Spanish. We do however have clues in our writing to the stress pattern. Specific word endings denote a specific stress pattern. Of course because we are talking about American English there is always to be exceptions to the rule. One easy rule to remember is that when a word ends in -tion or -sion as in description and confusion, the stress will fall on the syllable right before the ending: description, confusion. We stress the syllable by making it longer, louder and with a change in the tone. I have created a podcast and posted it on the right, of the following words. Listen for the stressed syllable. pediatrician, discussion, obligation, explanation, creation, application, section, relation, fusion, conversation, musician, observation, ration, attention, presentation, obsession, realization. Okay, so you have gathered some information about how to tackle the American English pronunciation of words. You have mastered a few sounds in private, and are beginning to recognize which syllable needs to be stressed. Yet you still feel awkward or embarrassed to attempt to "talk like an American". Maybe you even worry that native Americans will think you are making fun of them when you attempt to put on the American accent. What I will suggest to you, is that you try incorporating one of the features you have learned into something you say everyday. Something that you don't need to think about such as "have a nice day", or if your answer phones " Hi this is....how can I help you?". If you feel that you just forget to do this in your busy day, use a reminder. Switch you watch to your other hand, put a post-it on your computer, move your water bottle to the other side of your desk. Try not to feel self-conscious, keep in mind that it is human nature for people to be so wrapped up in their own lives that your pronunciation is not on their mind, unless of course your pronunciation makes the conversation difficult to understand and therefore more work for them. What may sound like an exaggeration to you will merely sound like good pronunciation to most of your listeners! Intellectual knowledge is a good thing, applying what you know to your life is even better. For example knowing to eat healthy does not help, actually eating healthy does. It is the action you take with the information you have that will make the difference. Trying to master the American r! Many people find the American r to be one of the trickiest of sounds to master. The two most common issues are trilling or substituting a /w/ for the r. A trill is when you tap the tip of the tongue onto the bumpy ridge behind the teeth (called the alveolar ridge). The /w/ sound is created when the lips are slightly rounded and the tongue remains on the bottom of the mouth. In either case there needs to be a change in the use of the muscle of the tongue. To facilitate this change we need to begin with some oral-motor exercises. This will help your tongue, which is a muscle, train for a whole new position. The new position is with the tongue retro flexed (or curled back) so the tongue tip is up off the bottom of the mouth and slightly curled toward the back of the mouth. So if you looked in a mirror you would see the bottom of your tongue. Now the /r/ is what we call a semi-vowel, it is called this because the /r/ is used in writing as a consonant, but it is produced as a vowel. Vowels are produced by shaping only. Meaning that there is no obstruction or stopping of the air flow. The tongue will make no contact with any of the other parts of the mouth. The /r/ is influenced and influences the vowels that are near it. So what will happen is that when /r/ is followed by an /I/ sound for example, then you will begin to produce the /I/ sound while the tongue is still retro flexed or curled back. Causing what is known as r-coloring of the vowel. This happens because the /r/ is a difficult position to get in and out of, so the two sounds end up interacting. This is a tricky sound because in a mirror all you will really be able to see is the bottom of your tongue, and because for most ELL's it means re-training the tongue muscles. The first thing we need to remember is to stay focused on the moment. Instead of thinking of how hard it will be to change our speech pattern forever just focus on the immediate change and how to incorporate it into your speech. There is a saying, by the yard it is hard, but inch by inch it's a cinch. The one thing you can do today is to think about your final voiced consonants. What is this? Many words are made of consonants-vowels-consonants or CVC such as hat, big, hit, cab. All of those words follow a C-V-C pattern. In English unlike many other languages we use voiced consonants at the end of words. Look at these sounds. The first column is voiceless sounds, the second column are sounds that are produced in the same place and manner but are voiced. Devoicing of final consonants is a common feature of non-native speakers of English. On way to help them correct for this is to have them hold the vowel before the voiced consonant for 2 beats. Minimal pair contrasts. So when you see a word that ends in a voiced consonant make the word longer.